We camped Friday and Saturday nights in Sparta, NC, right along the water at the lovely New River Campground, a small, private campground that accommodates tents and campers, with tents being well separated from the RVs. Hooray!! They also rent canoes and kayaks. I made one of my dumbest mistakes ever by mapping a “nearby” New River outfitter with an almost identical web address. Driving there, we went a good 20 mountain miles out of way, and our cell phones (ATT) didn’t have signals. Lo and behold, the one driver I could flag down for help was returning from dinner to his campsite — at New River Campground. How lucky was that?! So back we went, happy to finally pitch our tent just before dark. Sunday we drove the 20 or so miles to Galax, Va., the southern end of the trail, which officially starts northeast of there in Pulaski. Galax, pronounced GAY-lax, is a former manufacturing town of 7,000 that still seems pretty depressed beyond its very spruced up historic Main Street area. That strip was deadsville on a Sunday morning, so we didn’t get to see it in action nor eat at the famed Galax Smokehouse. Galax is one of the best known stops along The Crooked Road, Virginia’s Heritage Music Trail. It’s home to the Old Fiddler’s Convention, a famed traditional music convention since 1935, and the Blue Ridge Music Center, a few miles away on the Blue Ridge Parkway. We had breakfast at the best choice, Aunt Bea’s, a fast-food crossover that cooks the eggs and meat, but serves it up on Styrofoam. The clientele was very, very country. Fully carbo-loaded, we hit the trail at 10 a.m. for six hours of cycling. We took our time and stopped often, so made it only 22 miles out and back, for 44 total. We were on touring road bikes. Hybrids or mountain bikes, with fatter tires, would be better on this trail, but we were fine. Confession: we didn’t wear helmets! But we did carry them, just in case we ended up needing to be on the road. We passed several runners, walkers, and cyclists, including families and a Boy Scout troop. Horses are allowed on most of the trail, and though we saw signs of them, we didn’t meet up with any. 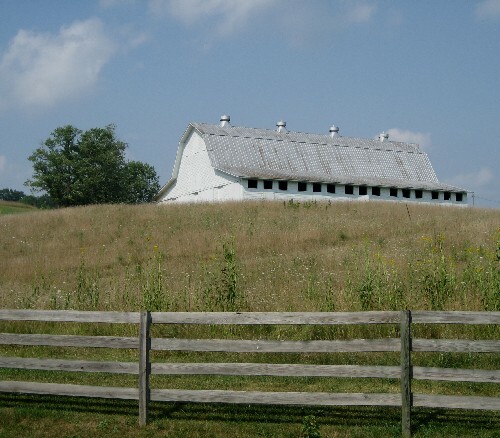 We passed gorgeous meadows with barns glistening in the sun, shady wooded areas, rushing water, and picnic and waterfront camping areas, one with campsites for horses. We loved cycling over the old railway trestles and many smaller bridges. 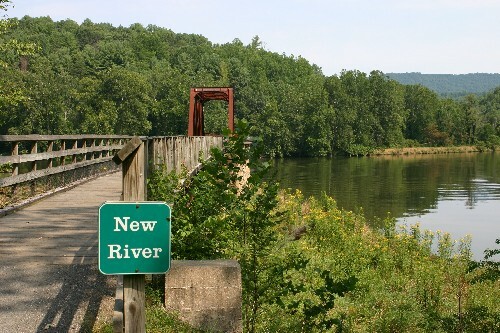 We first started along Chestnut Creek and then the New River. We saw people and great blue herons fishing, while flocks of Canada geese hung around to watch. We took a side trail to the tiny riverfront town of Fries (“freeze”), which is slowly being discovered by retirees and second-home buyers. With its former textile manufacturing base decimated, I hope new arrivals and tourism save this lovely place. At mile 49.5, we stopped at Cliffview Ranger Station, which has a great little gift shop, indoor restrooms, and ice-cold water in its fountain. It was a perfect day. 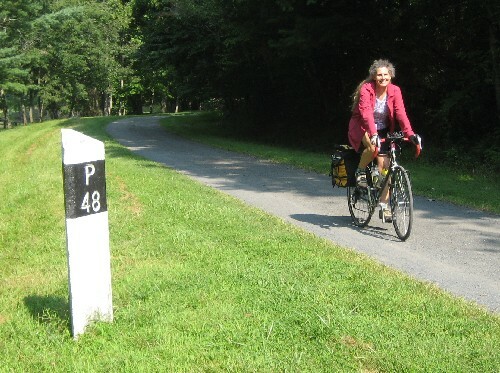 Thanks to all the rail-trail advocates and the state of Virginia for providing such a beautiful trail and park. This entry was posted on August 27, 2008 at 8:30 am and is filed under Bicycling, Environmental, Kayaking/canoeing, Virginia. You can follow any responses to this entry through the RSS 2.0 feed. You can leave a response, or trackback from your own site. Such a nearby goal and yet such a satisfying trip. Is this the answer to consumerism ?